I had two teen books that were under a pen name, because I didn’t want readers to get confused as to which were teen books and which were adult. BUT, teens were reading my adult books and adults were reading my teen books, and some didn’t know about the other. 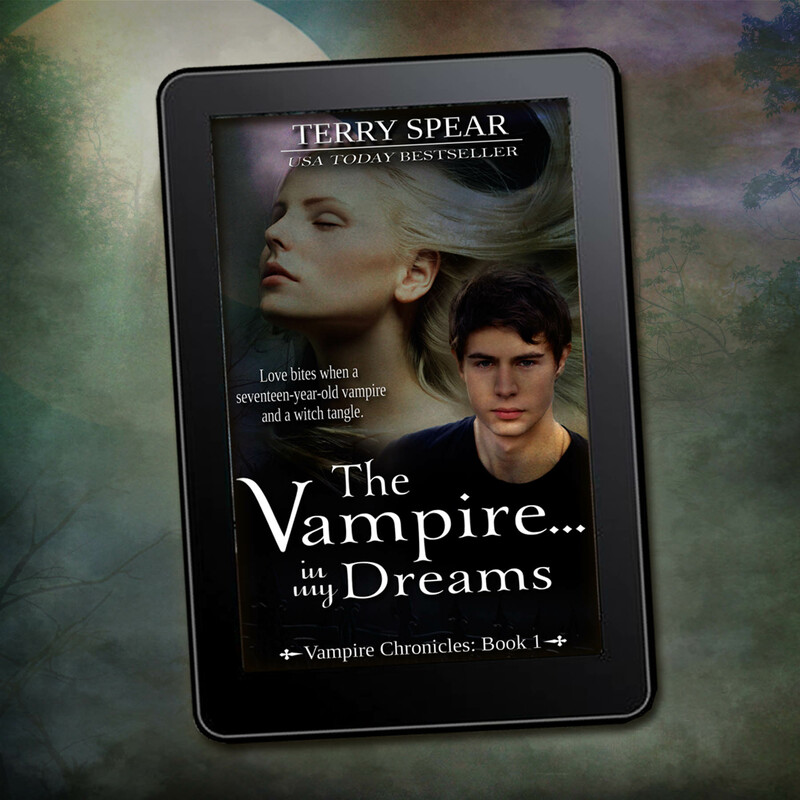 So when I began writing teen books after those two, I used my Spear name and I vowed that when I got my rights back to these two, I’d change them (The Vampire…In My Dreams, and Deidre’s Secret. I also had Ghostly Liaisons under my pen name, but the publisher closed their teen line a month before the book’s release, though it’s still showing up on Amazon as coming soon). I feel I’m ushering in a new era. It is now available on everything but Nook, coming soon. I also will be working on the print version next. I’ve thought about audiobook, but sales are really slow on some titles, and we have to put out quite a bit of money to produce them. You can do it with no money paid, then share royalties 50/50 with the narrator, but I’m the ultimate optimist, and so like with one author who did that and sold a million copies, she was paying the narrator all that money for seven years for a few hours work, when it can take the author months to write the book, the costs of editing it, making the cover, and all the promo we do, etc. Not that I’d ever sell a million copies of any of my audiobooks, but you know, it’s a gamble. We NEVER know when a book will become a hit. Never. And that means being in the red on lots and lots of audiobooks for months and months and years. I have 21 audiobooks out now, 6 more in process. And of those, only two are in the black, and two more will be shortly–a few months. The others? Years, at the rate they’re going. We just don’t earn hardly enough on the sales we do make, and sales aren’t as high anyway for audiobooks as they are for other versions of the books. And yet, some of the big hitters say it’s important to have your books in every format there is. If I had unlimited money, I’d just do it. 🙂 So I’m waffling. Indecisive. 🙂 Don’t you hate it when you’re that way? Love bites when a seventeen-year-old vampire and witch tangle. Proving a guy is a vampire for the glory it will bring seemed like a good idea. At the time. Until he needs Marissa Lakeland’s help to fight the vampire who made him the way he is. No problem. She’s a witch. Witches can handle it. But vampires don’t exist, and there’s nothing in a witch’s training that deals with a creature that doesn’t exist. So using her wits, she’ll manage, right? If the creature of the night doesn’t get her first. As a centuries-old vamp, Lynetta doesn’t lose ever, and she doesn’t intend to now. So I’m having the last of the windows replaced out front, right before Thanksgiving. I’m glad I’m doing this piecemeal. What a mess everything is again and I just had cleaned up. Hopefully, they’ll get everything done today, and I can begin to really clean and decorate for the holidays. I don’t do a lot of Thanksgiving decorations because lately, I’ve been visiting my son or my daughter for Thanksgiving. Talk about ushering in a new era. In the past, I thought I’d always be making the turkey at my home. 🙂 I’ll show off more later. I have metals turkeys and a wooden turkey. Don’t remember when I got some of these things, but it’s fun having something that’s unique. I finished proofing both The Vampire…In My Dreams and Kiss of the Vampire. Still working with the beta reader on Call of the Cougar. And that means it’s time for me to get back to Phantom Fae, and that means I’m back to having word count goals. I also had only one bear left to make, a Dragon Bear, but now have 2 more Steampunk Bears to make. 🙂 So trying to get those done before the kids come in next weekend. ← Almost Done with Bear Orders!